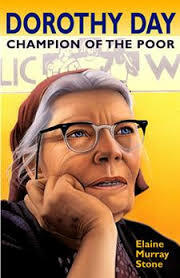 We celebrate Dorothy Day, born this day in 1897, one of “four great Americans” mentioned by Pope Francis in his recent address to both houses of the United States Congress. Radical in her lifetime, Dorothy Day worked in the first half of the 20th century for world peace, women’s right to vote, and justice and relief for the poor. With Peter Maurin, she co-founded the newspaper The Catholic Worker, which promoted Catholic teachings in Social Justice, applying them to social issues. The paper gave birth to the Catholic Worker Movement, which put Catholic social teachings into practice, establishing homes of hospitality and settlements for the poor. The work of Day and Maurin continues today in over 200 communities throughout the United States and 28 abroad. A convert to the Catholic faith, Dorothy Day passed through a life of personal turmoil to heroic virtue and devotion to the church and the poor. Communism, abortion, divorce, common law marriage… all were part of her experience and all played their part in the depth of her conversion, formation of her character, and what eventually made her the saint many believe her to be.